New Delhi: Finance Minister Arun Jaitley has promised to consider to hike the minimum pay of central government employees beyond Rs 18,000, a day after the cabinet cleared 7th Pay Commission award for its employees. Central government employees have been demanding hike in minimum pay since November 19, when 7th Pay Commission headed by Justice A K Mathur submitted its report to Jaitley. The Finance Minister said he was not ‘rigid’ on the issue and the government will try to rectify some of employees’ demands including minimum pay. Jaitley met with representatives of central government employees unions at Home Minister Rajnath Singh’s house for two hours till 11pm on Thursday night. Jaitley, Rajnath Singh and Railways Minister Suresh Prabhu attended the meeting and assured unions leaders of central government employees that their demand would be looked into. “The minimum pay of central government employees Rs 18,000 was made on recommendations of the 7th Pay Commission. But government will consider hiking it after discussions with all stakeholders,” he said in the meeting. “Three ministers called us and we met them at Home Minister Rajnath Singh’s house late on Thursday for almost two hours. We have been assured that the minimum pay issue is going to be referred to one of two committees that the government is setting up to rectify any anomalies in the pay commission recommendation implementation,” Shiv Gopal Mishra, General Secretary of the National Joint Council Action (NJCA), a confederation of several central government employees’ unions, told reporters after the meeting. The council claims a membership of 3.3 million, including the central government employees – Railways, Defence, Postal, Income Tax, Central Customs and Central Excise etc. NJCA already have rejected Modi government’s overall 23.5 percent pay hike bonanza based on 7th Pay Commission recommendations and would go on indefinite strike from 6 am, 11 July. They have been demanding Rs 26,000 as minimum pay instead of Rs 18,000 approved by the government based on the 7th Pay Commission’s recommendations. Mishra also said the Home Minister assured them that “their interaction with us has the blessings of PM Narendra Modi”. “On minimum pay, we are for a negotiated settlement and it seems there is some consideration at the highest level,” he added. The increasing the minimum pay will change the salary fitment factor. 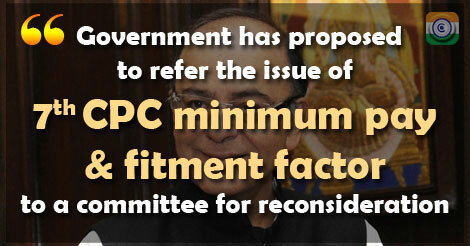 If the minimum pay is hiked from Rs.18,000 to even Rs.20,000, the fitment factor will be higher than the 2.57 times approved by the government based on the pay commission recommendations. NJCA wrote to all central government employees unions that “government has proposed to refer the issue of minimum pay and fitment factor to a committee for reconsideration. The NJCA will await communication in this regard from the government”. It said that it will meet on 6 July again to decide on the proposed indefinite strike from July 11.